Painter, printmaker, writer, poet and polemicist, Bartolini spent his youth in Rome, Siena and Florence and completed his studies in 1910 at the Istituto di Belle Arti in Siena. As a printmaker he made his first etchings around 1909 in Florence, where he studied the prints of Jacques Callot, Giovanni Fattori and Rembrandt. During the World War I, Bartolini fought as an officer at the Front. He resumed his artistic activity in 1919, establishing himself mainly as a printmaker. 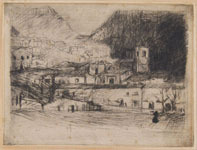 In 1932, along with Giorgio Morandi, he won a prize at the Mostra dell’Incisione Italiana in Florence and in 1935 obtained first prize for printmaking at the second Quadriennale at the Palazzo delle Esposizioni in Rome, where he exhibited 50 etchings. 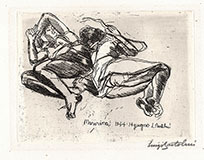 He exhibited again his prints at the Biennale in Venice, in 1942, at the Rassegna Internazionale in Lugano, in 1952, and at the Calcografia Nazionale in Rome, in 1962.